The other day I was puttering in the kitchen, trying to remember the last time I was bored. There just isn't time to be bored when you're an adult - even without a family to care for! Yet when I was a kid, I would occasionally complain of boredom. Mom would look shocked and ask how I could be bored with so many chores to do in the house!? This was my cue to clip my toenails or look for that thing I think I may have lost at some point, somewhere. 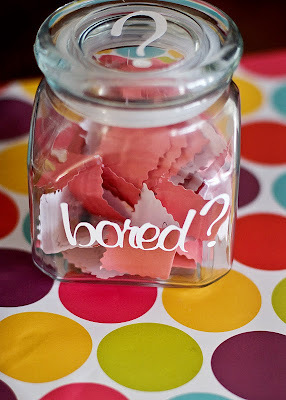 Mandi over at Tidbits from the Tremaynes solved her kid's boredom dilemmas with a "Bored Jar" which is so genius I want to make one! Then I would sucker some children into my house and bore them into reaching for one of these. She says "Tell me you're bored? Go pick a slip of paper. You might get lucky, you might get totally screwed." Her kids might end up folding laundry or even CHANGING A DIAPER! She admits 30% of the slips are fun things like baking or park trips but 70% are things no kid would choose to do on their own. I'm so glad my mom doesn't use the internet and will never see this. Haha, wow...you know, my nieces have just started saying they're board, maybe I should make them a jar? But come to think of it, five and six year olds might just be scarred! LOL just thinking of my kids saying they're bored makes me want to stand on my soapbox, saying "when I was a kid, I didn't have _____ and _____ and _____"
It's genius!! If I ever get stuck with nieces or nephews I'll keep this in mind. I have to agree with Mandi, I'd be tempted to go on and on about the things that didn't exist or I didn't have as kid. It'd be so bad that they'd never utter those words again! That is genius! My mom totally needed one of those.